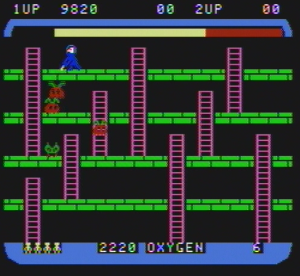 You’ve heard of Lode Runner, right? There’s at least a moderate chance that you have, if you’ve ever been into classic video games, as it was pretty popular in its day. 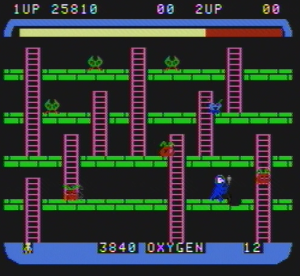 Lode Runner is what I immediately thought of the first time I played a little game called Space Panic for the ColecoVision a few months ago. You can imagine my surprise when I did some digging (no pun intended) and discovered that Space Panic actually came before, and likely served as an inspiration for, Lode Runner. In fact, depending on who you ask, it is a likely candidate for the very first platformer, serving as the predecessor for the likes of Donkey Kong and Super Mario Bros. In this review, I’ll be discussing the ColecoVision version of Space Panic. The game was originally released in arcades, and saw multiple other releases on Apple and Commodore systems, but I have no real means of comparing any differences between them. A possible first stage of Space Panic. In Space Panic, your objective is to eliminate all of the aliens in each screen. You do so by navigating the maze-like stage, using ladders to ascend or descend to other levels, avoiding the enemies and digging up holes. When an enemy falls into a hole, you must fill the hole back in, knocking the enemy down to the floor below, killing it. It takes time to dig or fill holes, so you have to watch your back and plan ahead if you don’t want to be caught unawares. There are three types of aliens: red, green, and blue (I’m not sure if they actually have names). Red aliens are the slowest, and are only worth 100 points. Green aliens are worth 300 points, and move a little faster. 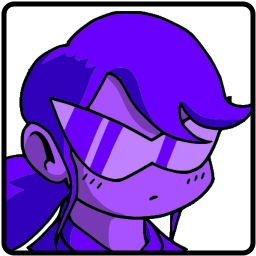 Likewise with the blue aliens, which are the fastest and which are worth 800 points. These are the only enemies you’ll encounter throughout the whole game. However, there is a bit of a twist: each successive alien type is harder to kill. As I mentioned before, you kill red aliens by knocking them through holes. Green aliens, however, must be knocked through two holes – that is to say, you must dig one hole on one floor, and another hole lined up with it on the floor directly below. Then, you must lure the green alien to the uppermost hole, fill in the hole, and knock the foe down two stories (each hole it falls through is automatically refilled). Blue aliens must be dropped through a whopping three holes in order to dispatch them. Oh, and if you fail to drop a red or green alien through a hole before it escapes, it will transform into a more difficult version. Therein lies the difficulty of the game. The strategy involved can be a bit more complex than what it seems on the surface, though. For example, holes can serve as a quick means of escape if things get too hot to handle, but this may lead to an enemy becoming trapped, then escaping before you have time to kill it… thus making it stronger. Alternatively, you could intentionally allow your enemies to escape, turning them into stronger versions, and then killing them to gain bonus points. If this sounds too difficult for what it’s worth, it’s actually possible to kill any enemy type with one clean hit by dropping another enemy on top of it. It has to be timed correctly, but when it happens, it’s quite satisfying. You also have a limited supply of oxygen, indicated both by the bar at the top of the screen and by the colour of the protagonist’s face. Having not grown up wtih a ColecoVision, I wasn’t really aware of its graphical capabilities until just recently. It’s actually quite impressive for a home console of its time, I think. 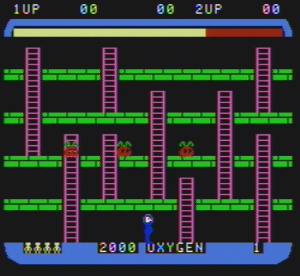 As the player character loses oxygen, his face gradually becomes more and more red. It’s not even a jerky transition, either, like what you’d expect on an NES or something – it’s a smooth transition. I’m sure that I’m really showing my general ignorance of the ColecoVision here, but… that system had some impressive graphics. But I digress. If you lose all oxygen, you lose a life. It’s basically a timer, to keep the player from dawdling too much. The game starts out with just three red aliens, but each successive stage contains one more red alien up until there are seven in a stage. Then, the next stage resets the number of aliens back to three, replacing one of the reds with a green. 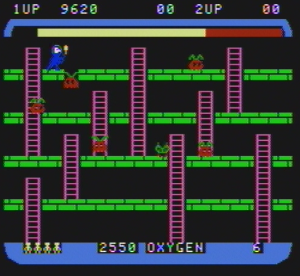 Slowly, more green and, eventually, blue aliens are added, until presumably the screen is just filled with blue aliens. I’m not sure, as I’ve yet to get that far. Also, each stage is procedurally generated, meaning that you likely won’t have the same game experience twice. I find this to be really cool and unexpected for a game of that era. Procedurally-generated, often roguelike platformers such as Spelunky have been especially popular in the last several years, likely because one can replay such games many times and still experience new environments and situations. Space Panic, on the other hand, is such a simplistic game with so few enemies and traps that the use of procedurally-generated stages acts more as a saving grace, allowing one to continue to enjoy the game despite its minimalism. It’s not that there’s anything wrong with statically designed stages, because there’s not. However, with a game like this, where the only real escalation of difficulty is in the number and durability of enemies, eschewing static level design is rather ingenius, and I applaud that decision. By level 12, things are already quite chaotic. That’s really all there is to this game. It doesn’t sound like much, but consider the fact that it was released in a time when nobody had ever played a platformer before, and during which digging games were uncommon. The level of creativity on display here is quite inspirational, in my personal opinion. More than that, it still holds up today, remaining as fun and engaging as ever. If you’d like to take a trip back to the birth of the platformer, you should give Space Panic a go. It deserves it. After all, it was a commercial failure, likely because its gameplay was so unprecedented. A game like this should be given more proper attention. You can easily obtain a copy of Space Panic by buying an officially-produced ColecoVision Flashback, which comes with original ColecoVision controllers and a plethora of other fun-but-forgotten games.